Heritage Book Shop was founded in Los Angeles in 1963 by Ben and Lou Weinstein. 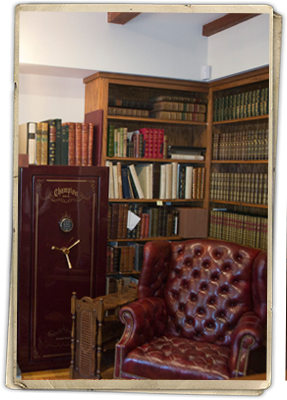 An internationally renowned antiquarian bookshop specializing in fine copies of rare books and first editions, Heritage maintained one of the largest and finest inventories of rare books and manuscripts in the world. After downsizing in 2007, Heritage Book Shop moved from its iconic building on Melrose Avenue through several locations and finally into Ben's home in Tarzana where he is open by appointment. In addition to his over fifty years of experience in the antiquarian book field, Ben Weinstein has been an active buyer at all of the major antiquarian book and manuscript sales in New York and London and at all major auction galleries, including Sotheby’s and Christie’s. Mr. Weinstein has lectured in the United States, as well as at the University of Manitoba in Canada and has taught classes in rare book collecting. In February of 2009, he completed the "ABAA Seminar on Book & Manuscript Appraisal." Mr. Weinstein is an active member of both the Antiquarian Booksellers Association of America (ABAA) and the International League of Antiquarian Booksellers (ILAB), and he served for two terms as the President of the Southern California Chapter of the Antiquarian Booksellers’ Association of America. He also served on the Board of Directors, the Ethics Committee and the Membership Committee of the National Chapter of that association. On request, Heritage maintains extensive records of desiderata that are reviewed and offered as the books and other items become available. Specifications and budgeting requirements are conscientiously honored.